Bongbong Marcos has this to say on martial law accusations: History will speak for itself, saying there are two different kinds of people who asks questions: those who pose sincere and honest questions, while those who are simply prejudiced. Meaning to say, there are people who ask the question to attack you. So no matter what you say, it won’t make a difference because they just don’t like you, anyway,” Marcos said, according to CNN. [VIDEO]: Amid reports that the late dictator Ferdinand Marcos was buried at the Libingan ng mga Bayani at 12 noon of Nov. 18, activists hold a noise barrage to condemn what they called as an insult to the Filipino people. Bongbong Marcos keeps his silence when it comes to Vice President Leni Robredo’s accusations. Her subconscious already knew what will happen to her. She might wake up one day and no longer V.P. like a thief in the night. She is indeed one pitiful woman! Better ask former Vice President Jejomar Binay who was a humanitarian lawyer representing alleged martial law victims. 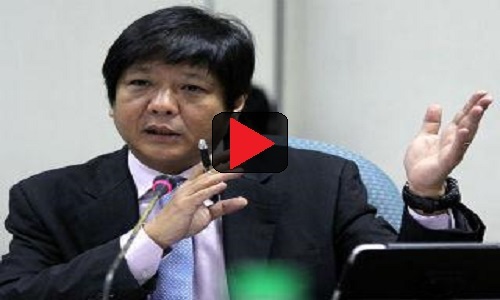 Why did he endorse Bongbong Marcos instead to replace him as V.P? His actions speak for itself. Hidden Wealth? Have you heard of the Philippines’ Gold Reserves at the World bank since 1960? The World Bank Data attested that the Philippines is one of the few countries that have ample gold reserves since the 1960s during the time of former President Ferdinand E. Marcos. A World Bank whistleblower also confirmed that it was the former and late president Ferdinand E. Marcos who embarked the gold reserves for the welfare of the Filipinos. “After the political cycle is done… it is a must to set aside politics and move on. Think about what should be done on how to achieve, how we can all work together to come up with solutions to the country’s problems… To be able to move the country forward,” said Marcos. STILL FERDINAND MARCOS IS THE BEST PRESIDENT EVER ………. WHAT I COULD’NT UNDERSTAND IS THE NEW GENARATION IS BEING POISONED THIER MIND AND BRAIN ……..THEY DONT KNOW THE REAL STORY OF MARTIAL LAW ……….. LIBERAL , RAMOS COJUANCOS AQUINO JOMA SISON AND NUR MISUARRI , THIS PEOPLE HAS TO BLAME FOR WHAT”S HAPPENING NOW ……..